I consider myself quite an able person. I am a woman and have the ability to multi-task and think of three things whilst performing two tasks. Or more. On the whole I manage to run my busy life efficiently -my large family, friends, church life, committees and work-with one eye on my diary and the other on my watch. I am like a duck - looking fairly calm from the riverbank but dive under water and see my metaphorical webbed feet paddling like fury. I am a juggler keeping many balls in the air. Flaming most of the time. It was the end of a exceptionally busy week and I was congratulating myself on managing to hold a themed dinner party for ten, drive hundreds of miles to visit lots of family members, entertain the children and get their hair cut in half term. I was just finishing the last thing - dropping my mum off at the airport for an earlyish flight on a morning when opening the curtains had revealed an unexpected sprinkling of snow on the ground. We had decided to leave a little earlier than planned just in case the road on the higher ground we needed to cross was icy or the snow was worse. Or there were roadworks, a car crash blocking the road or trolls under the bridge demanding payment for crossing. You never know. 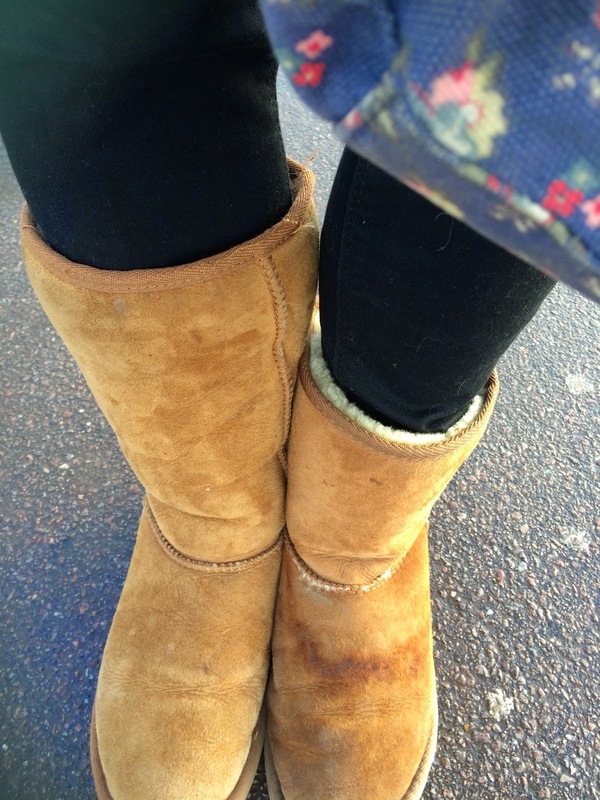 I threw clothes on, decided to forgo the shower in favour of dry shampoo and grabbed my warm sheepskin lined boots. Car packed, off we went - arriving at the airport in plenty of time which was lucky as her flight time had been brought forward slightly. My feet felt weird but I have walked more than I should this week and thought my old friend Fibromylagia was sharing some odd sensations with me as usual. Then for some reason after leaving my mum and walking back to the car I took a second to glance down. I stopped. I laughed out loud then looked around to see if anyone had spotted me. I was wearing odd boots. I hadn't noticed anyone in the airport looking at my feet. My mum hadn't even noticed. But now I had noticed I felt self conscious and abandoned my plan to stop at the supermarket on the way home! I have done just the same before now, infact I've worn jeans inside out and had a black and a blue shoe on for work before. Always embarrassing but best to just laugh it off! Earlier today I was thinking my pants is a bit lose. I am so happy because I thought hey I am losing weight! Yey! Then when I opened my jacket that I saw that I didnt zip up and button up. So I am just lucky that I have big hips otherwise it would have fell off!